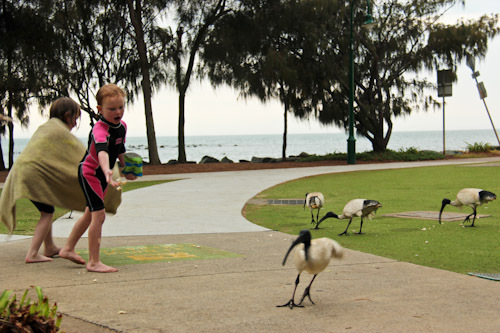 The peninsula of Redcliffe north of Brisbane is home to a number of family-friendly recreational activities, and playgrounds dot the parks that front the water. 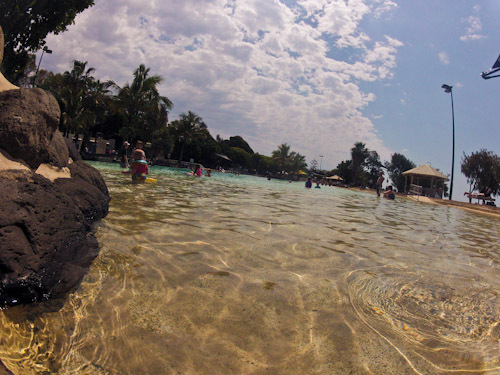 Today, we met up with another travelling family at Settlement Cove Lagoon — a public pool with water features, playgrounds, barbecues and shelters. Finding Settlement Cove Lagoon was a bit difficult in the beginning. 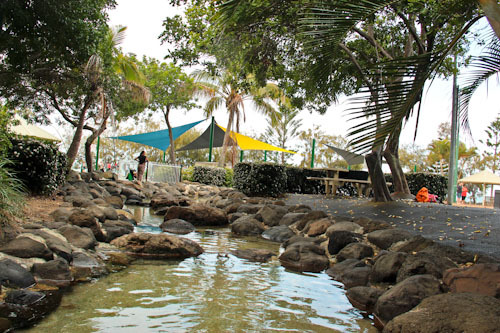 It’s nestled against the waters of Moreton Bay at the base of the cliff and not visible from Redcliffe Parade. I gambled successfully by parking the car at Charlish Park and then asked a local for directions. 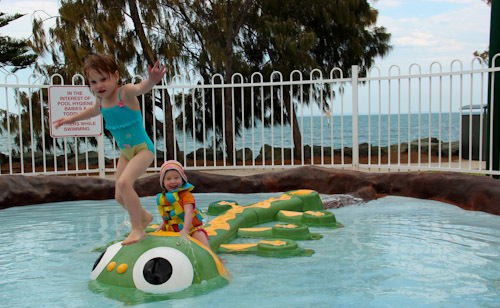 The pool features sloping entries, shallow pools around the edge and a maximum depth of 1.7 metres in the centre. A separate, fenced toddler pool has mushroom fountains and critters to sit on. Delaney and Calista explore the toddler pool together. They are pairing up more and more often for games and adventures. Smooth rocks line different sections of the pool, providing almost-irresistible jumping-off points that necessitate repeated public-safety announcements. 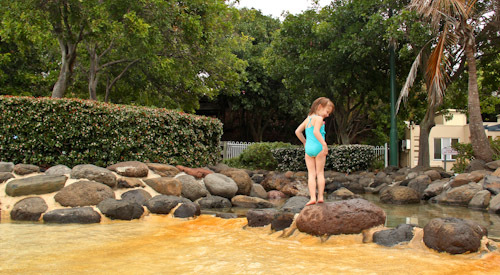 Calista uses the rocks as stepping-stones to cross to the other side of the lagoon. 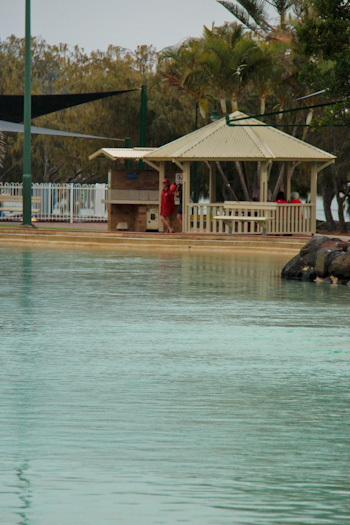 As we play at Settlement Cove Lagoon, storm clouds start to position themselves overhead. It was wonderful to see the Mackay family again. We’ve been online friends for a while and then I first got to meet them at Elijah’s unfuneral. We share a common perspective on spiritual matters and gentle parenting (after both transitioning from an initial conservative hard-line). I appreciate having like-minded friends whose children are older than ours — they gives me an example of how to parent teens respectfully. 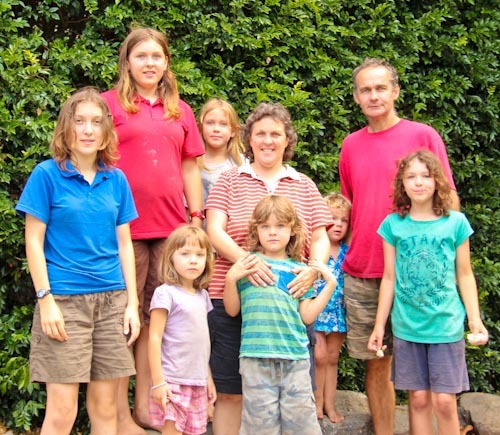 Mike and Sarah Mackay live on the road full-time with their seven children: Jasmine (15), Jessica (14), Chana (10), Susannah (4), Gabrielle (6), Jireh (2) and Chantel (12). 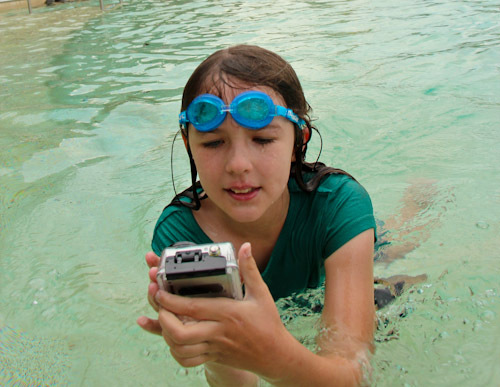 Chantel plays with the waterproof camera. 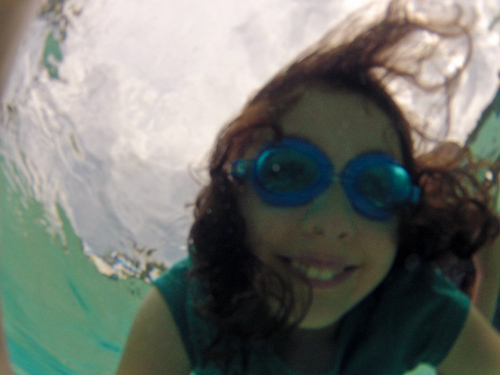 The underwater photos look great! 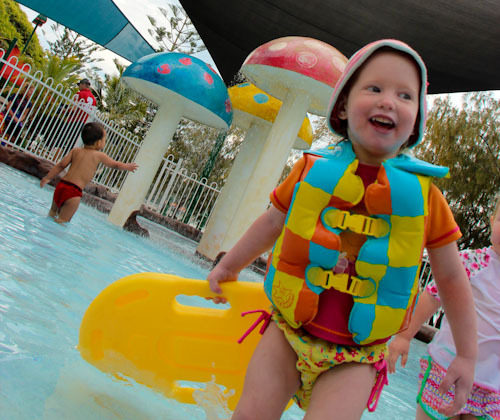 Calista is gaining confidence in the water and will soon be swimming independently. Aisha and Brioni feed the birds (tuppence a bag). I love the way they have developed a caring attitude towards all animals. When the lightning and thunder starts, the lifeguards instruct everyone to exit the water. After the wind blew in from Moreton Bay, the chill overtook our conversation, and we decided to retreat to our vehicles. 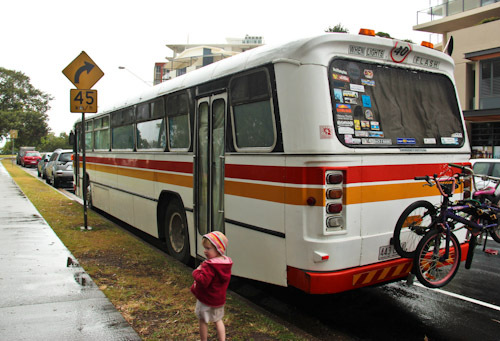 I envy the Mackay’s bus-life… ours is yet to start! 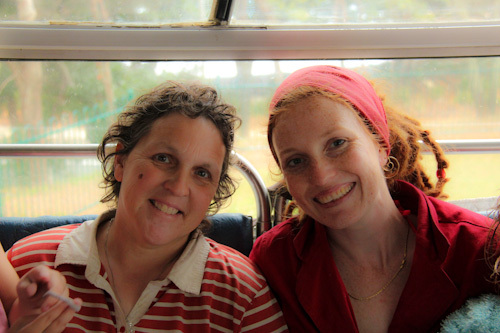 We visit the Mackays in their housebus — it feels like home, and increases my yearning to be on the road. Sarah is such an encouragement to me. She and Mike have lost one daughter after child-birth, and so she shares the pain of the grieving with me. 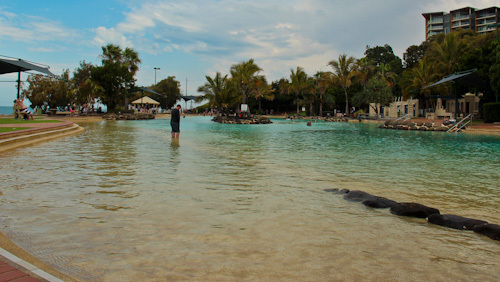 Settlement Cove Lagoon was a perfect place to hang out as a family. It’s been wonderful to connect with such a lovely family again, and we look forward to meeting up one day further down the road! It is so interesting to me how families are able to be on the road full time, especially this family that you just met up with having 7 kids. Where does the money come from to support this type of lifestyle? I’m really asking a genuine question as I feel like all my husband and I do is work to pay for the things we need for our family. Your insight would be very helpful. Thank you. It sure was a wonderful day. Our family really enjoyed meeting your family and hope we can meet up many more times. Lauren, you and your family are an inspiration to us! I want insight in to how the little things are acheived like laundry and meals :)…also the one thing that stops me from going on the road full time is that I always feel like I;m consuming so much more – petrol, food etc. When I am based somewhere I can grow my own food and source things locally without money through swapping and bartering with my own produce. Would love some links maybe to blogs of people who get around these things when the are on the road. Thanks Lauren. So glad you met a mother that understands your heart. That is so important. It is such a blessing to meet someone who truly has walked a mile in your shoes! I thought of making a facebook page called the green gypsy to try and brainstorm ideas like this. How to live on a little and still be green on the road. Do the Mackays have 7 daughters? Wow, what a blessing! I am sure the Dad will feel slightly outnumbered LOL. How awesome to see Mike, Sarah and the children here! Like the Mackays we have had a complete turn around in our parenting beliefs as well. In fact Sarah was the first person to introduce the concept of Graceful Christian Parenting to me. A beautiful family I love dearly! Sarah also introduced me to your blog. When we first met, Sarah was expecting her 6th daughter and we had 6 daughters. Now her poor sweet only son is tormented by my 7th daughter whenever they visit!